Guest post….writing and the research… (Dominic Selwood). You occasionally get a story told by a narrator who never moves. A great example is The Diving Bell and the Butterfly (1997), in which the author is imprisoned in a hospital bed, only able to move his eyelids. With superhuman patience, he narrates the entire book about his experience of being “locked-in”. A companion reads the alphabet to him thousands of times, and he blinks every time she gets to the next letter he wants. However, the vast majority of books require multiple changes of scene to keep them interesting. In an action thriller, this movement from place to place is critical to the pace and evolving drama. It also casts a wide backdrop, allowing the reader to be catapulted to wildly different landscapes and cultures, which heightens the sense of adventure. In my Ava Curzon books, the stories are located all over the world. They unfold in Washington, London, Paris, Rome, Dubai, Scotland, Ethiopia, Turin, Germany, Moscow, Donetsk, you name it. For me, half the fun of writing these stories lies in researching the locations. The plots are driven by codes, clues, puzzles, ciphers, and all sorts of other baffling mysteries, and the locations play a leading role in the stories and solutions. Answers are often closely tied to places – embedded into buildings, buried under landmarks, hidden in artefacts. My stories also involve a good dollop of history, which often means the locations are important to the plot, and their historical significance is regularly part of a puzzle’s solution. The books carry the strapline, ‘Where fiction and truth collide’, so the research element is a vital part of putting the story together. For instance, in The Sword of Moses, a key event takes place in a temple of Mithras buried deep under a church in Rome. Another unfolds at the former home of the occultist Aleister Crowley on the shores of Loch Ness. 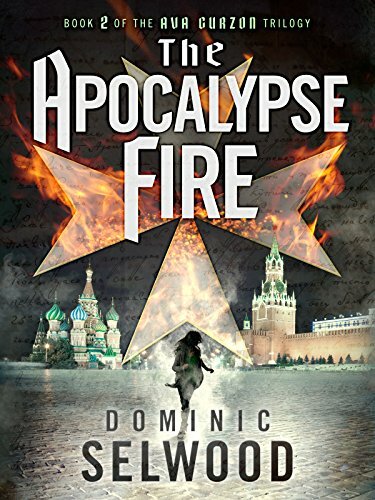 In my latest book, The Apocalypse Fire, significant scenes are set in the Kremlin, the Vatican, a crusader castle in northern Cyprus, and the old town of Jerusalem. Researching these places is some of the most fun I have when writing. It’s amazing how often you start with wanting to use a particular place because of its feel, but then when researching it, you find so much more. For example, when I first started thinking about the Kremlin, I had in mind rooms and corridors with a sense of power. However, when I started exploring the place, I found it has four cathedrals, and a medieval room in the oldest part of the complex that is painted gold and smothered with frescoes and gilded carvings of saints. Suddenly, the scene did not have to be in a vast grand state room, but could be in this intimate medieval chamber, where I could bring together the two big themes important to the main character in the scene: authority and religion. Another location in The Apocalypse Fire I really enjoyed researching was the castle of Montségur in south-west France. As I read more and more about the castle’s real story, it almost seemed sacrilegious to set my own story there. In the 1240s, Montségur was home to some of the last remaining Cathars, who were a group of heretics the Church had waged a crusade against throughout southern France. The Cathars made their last stand at Montségur, which was, in effect, an entire village in the clouds, clinging to the top of a virtually unclimbable mountain. In the end, Basque mercenaries were brought in from the Pyrenees, and they scaled the sheerest cliff face at night, and the Cathars eventually surrendered. Almost all refused to renounce their heresy, so 225 of them prayerfully and willingly entered a pen built specially on the hillside, climbed onto funeral pyres, and were burned alive. The more I read about it, the more I realized that the story of the heretics of Montségur is so dramatic and shocking – and so historically important – that I did not want it merely to sit in the background of my story. It is better than anything I could have invented, and I have been captivated by the tragedy of the Cathars for over 25 years. So I took the opportunity to weave their story – and especially the horror of Montségur – into the plot of The Apocalypse Fire. I first got a love of locations from Thomas Hardy, whose landscapes are so important to his stories that they are, in effect, characters in their own right. I don’t write the same kind of soulful, brooding, tragic stories as him. But I do feel the same excitement when I start researching a new setting as I do when I become absorbed in one of his hyper-atmospheric settings. Many thanks to the author for taking the time to provide this insight.